Get this Holiday Look ? This Holiday season, its time to take your Sequins out ! 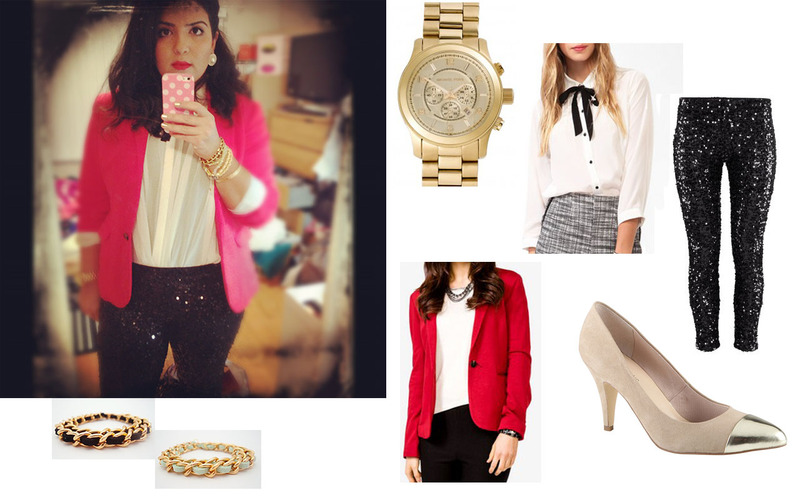 Here is an outfit I sported at my work Christmas Party and I am sharing with you how to get the look ! It is all about the PANTS ! I found these babies at H&M for an alarming 40$, after drooling over a pair at BCBG that were over 200$, but why pay 200$ for a pair of pants that you are most likely to wear once. Then the outfit came together by itself. I was going for an androgynous look, so I paired the sequin pants with a bow-tie top from VeroModa from last year's collection. But here is a very similar alternative from Forever21 for only 27.80$. Then I added a Red Blazer like this one from Forever21 for a whopping 39.80$. For shoes, I wore these Spring captoe pumps that you can get on special right now for 24.49$. Accessories are the key to any outfit, for this look, I went gold-toned, with my Michael Kors watch and my new bracelets from Mikaylove. The seller, Christianne makes the most amazing Chanel-esque jewelry that will add a little something to any outfit. Check out her Etsy store Mikaylove. If you have any questions, to hesitate to leave a comment. I absolutely adore this look! I loved that you went for the androgynous look - love that high collar/bow tie top.